The Extend Exposure dialog box lets you extend the exposure of a selected cell in the Timeline or Xsheet. For tasks related to this dialog box, see About Exposure. Lets you enter the frame up to which you want to extend the exposure. You can expose the drawing in the frames and replace the drawings that were originally there or move the subsequent frames forward in time. 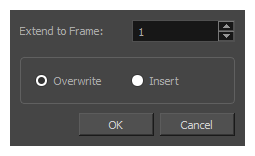 Lets you expose the drawing in the frames and replace the drawings that were orginally there. Lets you expose the drawing in the frames and move the subsequent frames forward in the Timeline view.